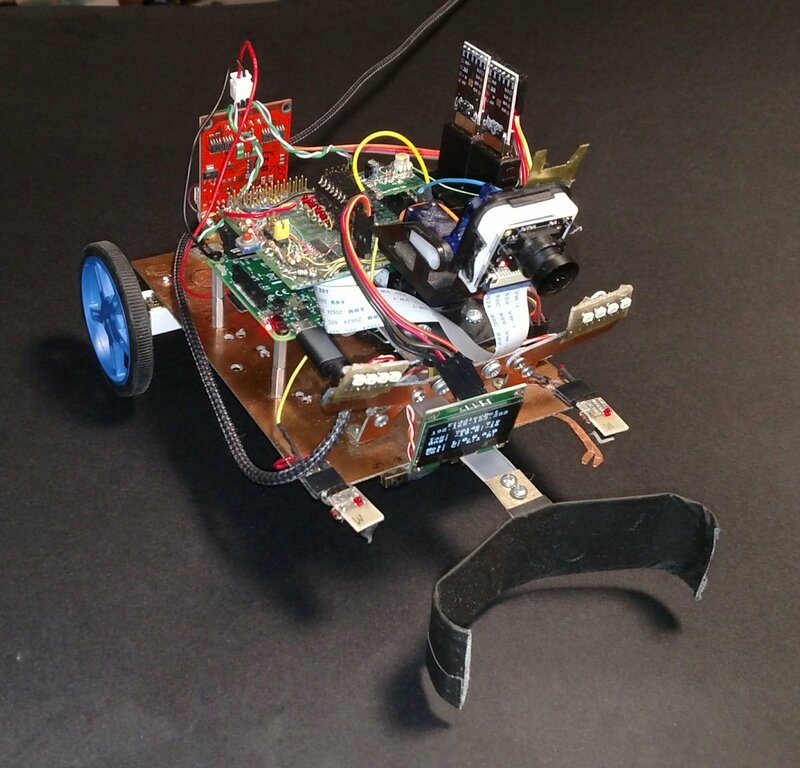 FiddlerBot sports a brain with hardware being the Raspberry Pi 3 board running Ubuntu 16.04.1 linux using the UbiquityRobotics.com Raspbery Pi Image. The Ubiquity Robotics image allows great support for automatic WiFi access point or setup as WiFi client. Also a node for full RaspiCam Native supported CSI interface cameras is present and in FiddlerBot's case I used a 160 degree wide field of view camera that works with the drivers for the normal RaspiCam camera. A ROS node has been developed to drive the 7 line by 15 char per line OLED display seen in the picture. The use of the ROS node allows any ROS node to publish to the 'topic' that the display node understands and so any node can place text on the display at any place. A feature rich set of functional subsystems run on this multi-node system implemented as many 'nodes' communicating via messages all with the help of the ROS (Robot Operating System) using the ROS version called Kinetic. My custom hardware sits on my custom surface mount IO board and takes great advantage of the I2C serial bus for many chips. The IO board includes an IO Expander for extra IO pins so I can control this robot's basic movements using radio hand controller. The software is composed of many ROS 'Nodes' (processes) for isolation and ability to re-use these nodes. Each node is in general either for inputs and sensors or for output to control some physical hardware and a 'main brain' node gets input and then controls the output hardware nodes. The nodes communicate over ROS Topics (messaging channels/queues) so I could use these nodes in future projects or swap in other hardware with little to no impact to the overall main control software. Highly flexible software architecture is the key to quick development, efficient reuse, and fault isolation. All the software is on my own GitHub private repository. A custom self-designed 'Claw-Arm' was developed that allows grab/release and raise/lower all to be done with ONE stepper motor! This arm is something I'm pleased with as I feel it may be a unique and simple solution applicable to many electro-mechanical issues. The claw arm can be quickly swaped out for a simple 'shovel' which is shown in the picture. One of the nice things about the modularity of the ROS operating system nodes, messages and other features of ROS is that in this case the entire wheel control module, RF input, Wi-Fi input node or Display node or collision nodes could be modified in this or some other bot later but the rest of the robot brains would be directly usable for future bots of mine. Modularity and main processor cpu load offloading is key to re-use as well as suportability and future enhancements. As a robot designer you gotta love having the flexibility of a modular set of subsystems. The video shows that FiddlerBot can accept a list of tasks to carry out and will then operate on it's own to atonomously carry out tasks. The tasks it can do now are things like find and object, turn towards the object, grab an object, Move to some other location identifed with an 'AR Tag' and then drop that object at that place. This bot uses a multi functioned web interface with semi-live video feed and control and status monitoring as it shows up on the Chrome browser seen on this page. Because FiddlerBot now works fully disconnected using WiFi and WebBrowser interface I can control this bot with my PC with hardline or laptop over wireless or my Android OS tablet OR a simple wireless controller. The extremely 'open' capability of the web browser combined with WiFi on the bot make for some exciting plans for remote presense and manipulation of objects as I move forward. FiddlerBot runs using the state of the art ROS (Robot Operating System) software structure and makes use of precise wheel control and camera and image recognition combined with a full remote control and monitoring web interface based to perform many tasks. In November 2018 a MAJOR restructure of FiddlerBot happened. Fiddlerbot now uses a Raspberry Pi 3 instead of Beagle Bone black. The Pi runs on the Ubiquity Robotics Image and thus I also added RaspiCam ROS node and Aruco fiducial detect ROS node. we can recognize objects far off to either side. 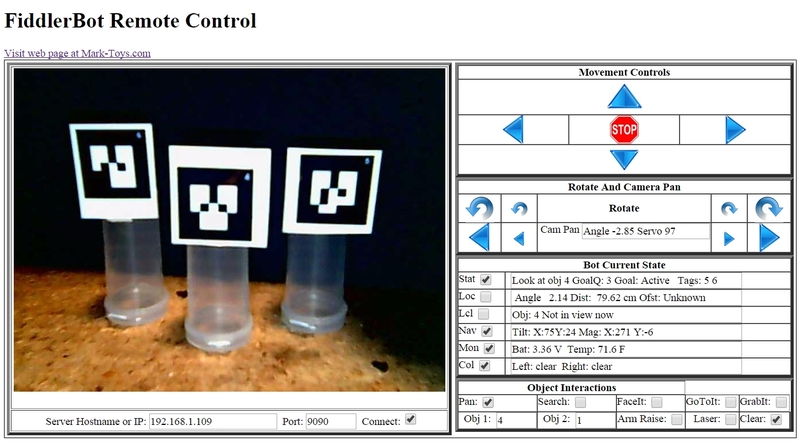 See FiddlerBot visually find and manipulate objects The video above shows that FiddlerBot can accept a list of tasks to carry out and will then operate on it's own to atonomously carry out tasks. The tasks it can do now are things like find and object, turn towards the object, grab an object, Move to some other location identifed with an 'AR Tag' and then drop that object at that place. 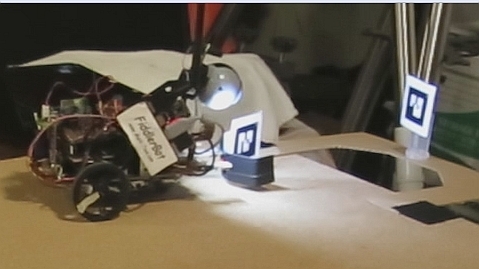 Fiddlerbot has motion, a shovel (shown) or grabbing claw (this his name) and even a 'Laser'.